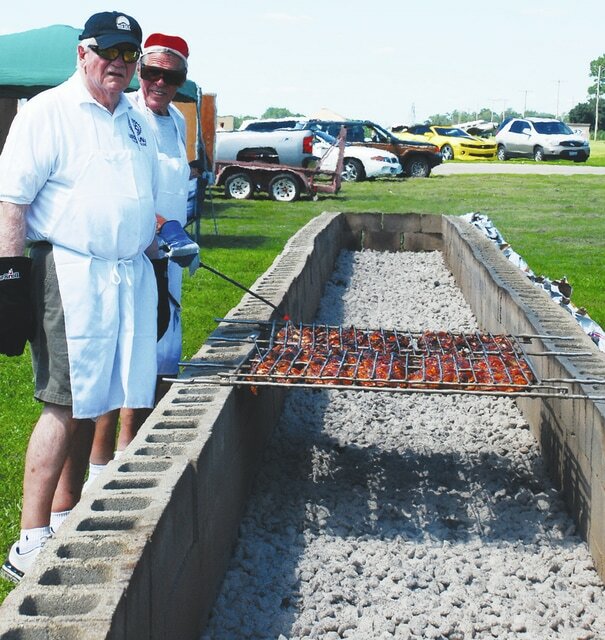 Rotarians Al Maurice, left, and Judge Roger Wilson take a brief cooking break to glance at the camera last year during the Urbana Rotarians’ annual chicken barbecue. 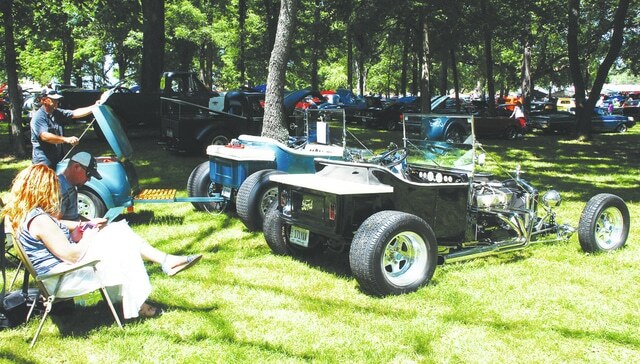 Champaign Cruisers’ annual Firecracker Car, Truck and Bike Show will be held again this year. 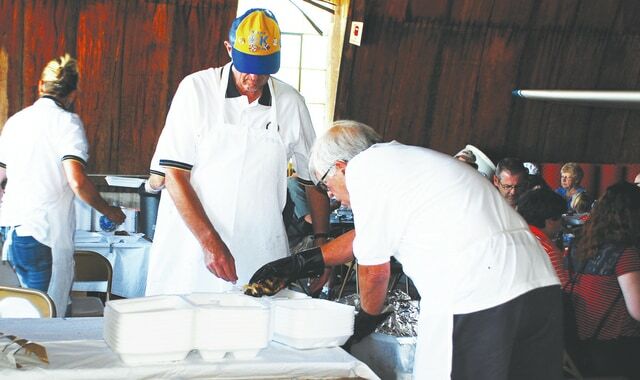 Rotarians prepare dinners during the 2014 barbecue. The city of Urbana and village of Christiansburg plan to celebrate Independence Day with a variety of activities this weekend. In Urbana on Saturday, July 4, the Champaign Cruisers’ 18th annual Firecracker Car, Truck and Bike Show will be held rain or shine at Skelley Lumber, 1300 N. Main St. Registration is 9 a.m. to 1 p.m., and awards are at 3:30 p.m. There is a $10 entry fee, and spectators can visit for free. For more information, visit www.champaigncruisers.com. The Urbana Rotary Club’s annual chicken BBQ will be held from 3:30 to 7 p.m. at Grimes Field with fireworks to follow at dusk. Prior to the fireworks show, Phil Dirt and the Dozers will perform at 7 p.m. at Grimes Field as part of the Champaign County Arts Council’s Concerts in the Park series. On Sunday, July 5, Christiansburg will celebrate with a parade, waterball and fireworks, as well as activities for young and old at the park. The Christiansburg Fire Company is hosting the parade and waterball, and the village park board will host fireworks at dusk (about 10 p.m.) at the park. The parade line-up is at 10 a.m. at the Chirstianburg feed store. All entries are welcome to join until parade time at 11 a.m. From the feed store, the parade will head west on Pike Street, north on Monroe, west on Second Street, south on Main Street, west on Pike Street, north on Wilson Street and end at the Christiansburg park. The Fire Company’s 40th annual waterball tournament will include fire departments from the area competing on West First Street in front of the firehouse. There will be trophies for the top five teams. Open entries will be accepted until 12:45 p.m. The bracket drawing and captains meeting is at 12:45 p.m. Competition starts at 1 p.m.
At the village park on Sunday, activities start with a 9 a.m. church service provided by local churches. A co-ed softball tournament will start early and last through early evening. At noon Chuck Lyons’ chicken and pork chop dinners will be served. Music, kids’ games and concessions will be available throughout the day at the park. At 6 p.m., a pie auction will tout the talents of local bakers. The Urbana Daily Citizen will not publish an edition on July 4. The UDC office will be closed on Friday, July 3. Publication will resume Monday, July 6 and the UDC office will reopen that day.